1.The first thing I noticed about Ashlee’s blog was the color scheme. The pinkish color really popped and was easy on the eyes, yet attractive. Her photos were well taken, especially the photos from her “Creative Devices” album. Those nature photos were great. Her sports photos were good too, they really looked nice with the minimal lighting from the night football game. For some reason I’m really attracted to sports pictures from night games, they give off a different feel. Her feature picture of the older gentleman and the lady dressed in 30’s saloon attire was interesting. The man seemed to be sharing a laugh with the lady and looked to be a funny moment. 2. The font used in her post “My hand in journalism” was very small and sort of hard to read. Her descriptions were good for her previous post, but the small font truly deterred me away from reading the assigned post. 1. I really enjoyed the simplicity of Rhanden’s blog. The white background and sharp black font was easy to read, and overally was just a clean looking blog. There wasn’t too much going on or many distractions. The action pictures were cool, I haven’t seen photos of frisbee like that before. In class Rhanden chose to look at his action picture of him diving for the frisbee, but that wasn’t my favorite. My favorite was either the shot looking straight down the guitar strings or the frshly squeezed lime. Both were interesting takes on the particular subjects. His captions were great, they definitely had character which is important to me. 2. I feel like Rhanden could have gone out and been a little more creative. He seemed to have just used what was around him. However, from what he used, he did well. The subject of photographing frisbee seems like there is a limit to how creative you can get with it, maybe it’s not that inetresting to me but a different sportssubject would have been better in my opinion. I truly don’t think the pasta picture should be in his top 5, I feel like he could have gotten a more interesting candid photo. The most engaging features of a successful multimedia story in my opinion is a good set of photos and a video that runs in tune with the given set of photos. A slight description of what the photos are can help too, while the media needs to be consistent with what story the writer is trying to portray. Here is an example of a good photo from the hail story from the Wyoming Tribune Eagle. 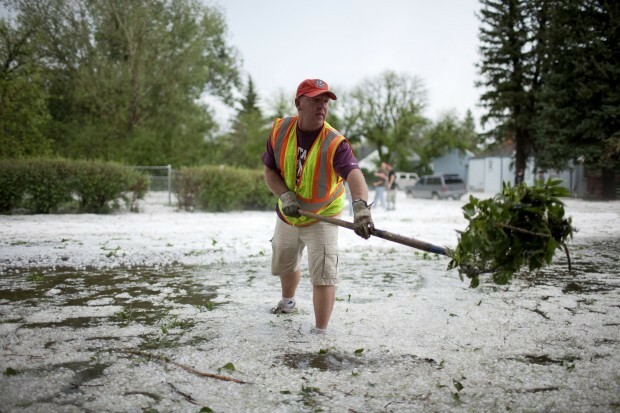 Man shoveling debris from recent hail storm in Cheyenne, WY. Some distracting aspects of a multimedia story are irrelevant photos. It’s frustrating to me when I watch a video and the reporter interviews somebody who is totally unprepared and doesn’t answer any questions that help me in understanding the point of the story. Off topic interviews and such are highly problematic for me.